Sugarlane Designs: FNSI...lets try again! Sorry about the delay....but aren't internet kiosks a wonderful invention when you're away from home!?! Here is the link for Friday night, which I've only just realised is Good Friday!! !...woohoo....there'll have to be an extra special Easter prize for this one!!!! And...an update on Dad......he came out of the surgery well......it seems he had an infection in the muscle around his abdomen and that's all we know at this stage but he's a trooper and after spending a night in ICU, he's out and about in the wards, giving us cheek, so he's feeling much better......thank goodness for those red buttons that release his pain killers!!!! And thanks to everyone for their lovely wishes, prayers, comments and blessings....they mean the world to us...it has been quite a stressful time and althought we're not out of the woods yet, we're over the first hurdle!!! Thank God! So join with me on Friday night to celebrate Easter and all things wonderful....I know I'm giving thanks...and plenty of it! So pleased he's over the first hurdle (sending prayers he continues to improve at a steady pace). Good to read Dad is over his first hurdle. Lots of prayers and hugs for you all. Hope you get to have a bit of stitching time too Wendy. Praise God for his blessings on you and your family. Looking forward to FNSI. Love and hugs. Praise the Lord for the good news on dad!!! 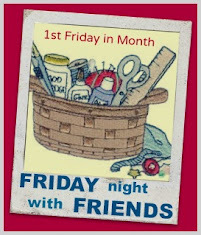 I'm on board for Friday night quilting! Good news! I like that! Cheeky is such a lovely word that we don't use here much. It's so descriptive. =) Have a wonderful Easter. The good news about your dad is making me smile. I have a plan for Friday night sewing ... if I can get past a little cold that seems to be getting worse instead of better, I'll be there.